Spring summer is my favourite season of the year. In childhood it signalled the start of the summer holidays, endless hours of Enid Blyton with my favourite music playing on the side with a bowl of mango pulp (sheekarni) next to me. Now, as I take a walk in the evenings and see the tiny flowers blossoming in the park, my heart is filled with happiness. But, of all the treasures of the earth, the one closest to my heart which I never tire of writing about is the matchless supreme fruit, the mango! 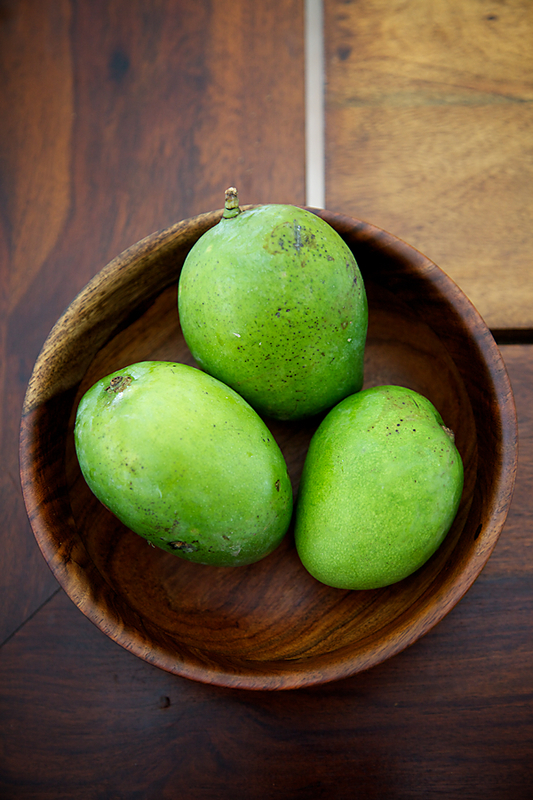 With the appearance of these seasonal green mangoes (it�™s a pity that raw mangoes are available through the year these days), I patiently await the appearance of the majestic manngo! Raw mango means many delicacies in our household, the tambli (raw mango soup) being a top favourite. One of the other favourites in this category is this gojju, one of the first dishes I learned to make from my beloved ajji (grandmother). One summer, as I relished a meal cooked by her and was particularly amazed with the taste of the raw mango gojju cooked by her, I went and sat besides her with a notebook in hand, the motive behind this being knowing the recipe to make this at my wish and will. The bonus of this recipe being that raw mangoes can easily be substituted with tamarind, to be enjoyed through the year. Ajji was always amused when I sat with her with a book in my hand. These are just simple dishes and not that great that they have to be noted down, she said. Not paying heed to her I went on asking her to describe the exact procedure, step by step, not wanting to miss a single ingredient or course of action required to replicate a similar taste, the taste of my grandmother�™s hands and ofcourse to preserve it for posterity. I still remember the thrill I experienced when I recreated the same taste sensation in her absence. From then on, every encounter with her meant talking and learning about food. 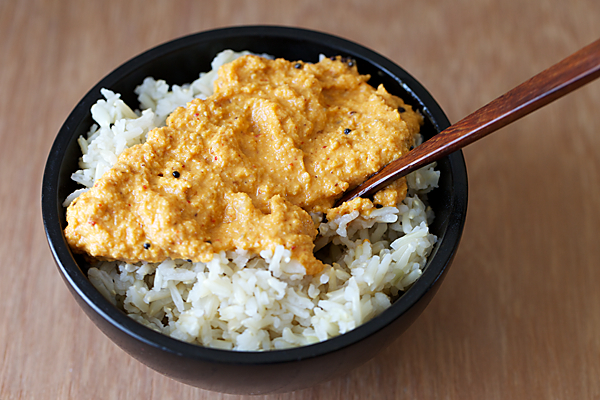 Mixed into hot rice with a dollop of ghee or coconut oil or eaten as a side with curd rice alongside a dry vegetable curry, gojju has always been comfort food for me. This tradition has lingered on and I love eating this condiment with white rice as well as brown rice. 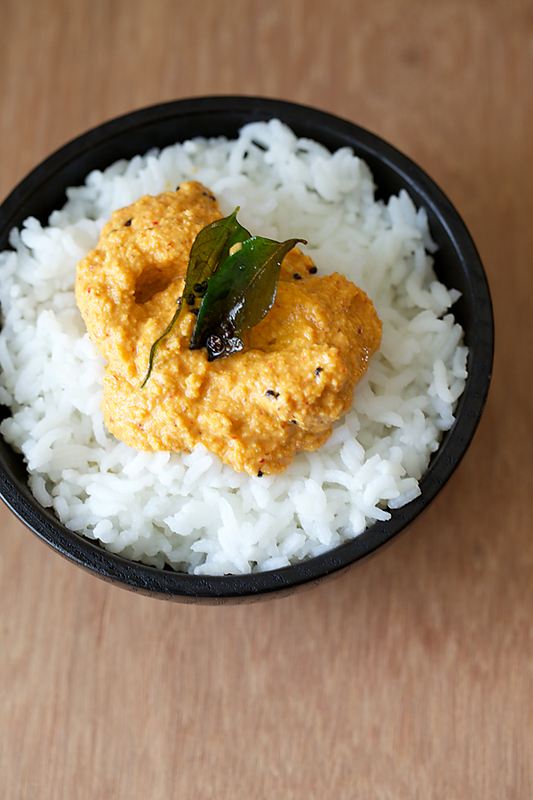 The tangy and mildly hot flavours of this traditional chutney which is an intrinsic part of a south Indian brahmin meal, leaves an imprint on the tastebuds long after the meal is done and the memories come back asking for more. This appetizing chutney is sure to liven up any drab meal! When raw mangoes are not in season, you can still enjoy this gojju by using tamarind. In a heavy bottomed pan, heat 1/2 tsp oil and put in the bengal gram and black gram dals. Roast over low flame for a couple of minutes and put in the dry red chilies. When the dals change colour and acquire a golden brown hue and just before they turn black, put in the fenugreek seeds and roast for about 30 seconds. Mix in the asafetida and coconut and continue to roast until the coconut is light brown in colour, about 3 to 4 minutes more. Allow the coconut mixture to cool down and add the raw mango pieces to it. Put in the water and blend to a slightly coarse texture. In a seasoning pot or pan, heat the oil and put in the mustard seeds. 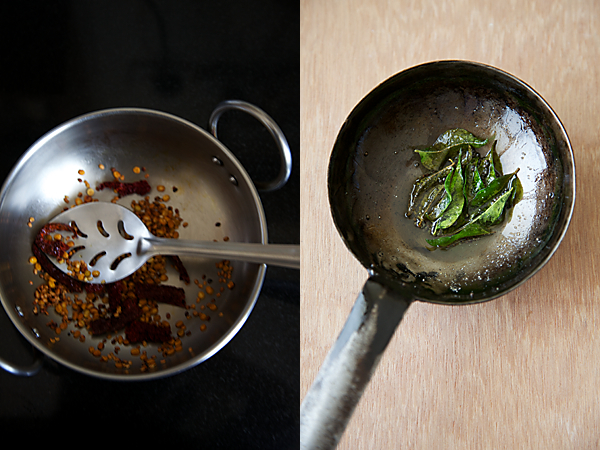 When they pop stir in the curry leaves and asafetida and when the curry leaves turn crisp, take off the heat. Pour the seasoning over the blended coconut mixture and mix well with the salt. * I use byadgi or bedgi chilies which give a nice colour and are not very spicy. 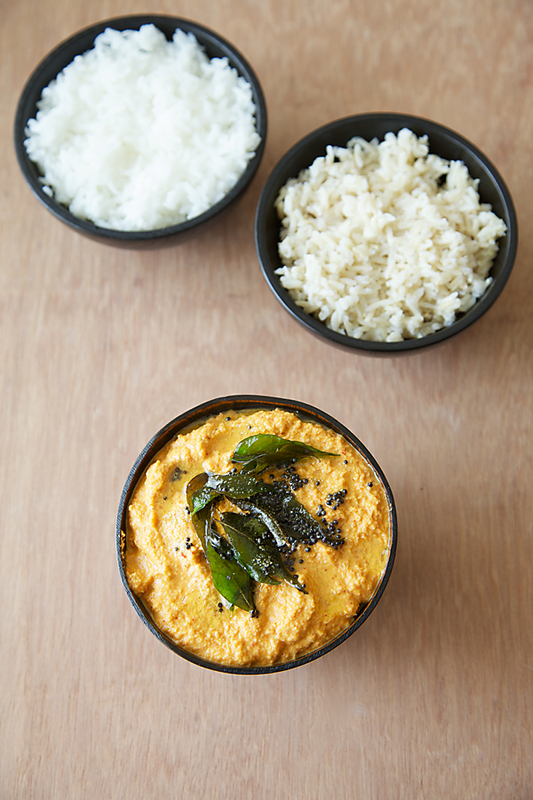 Remember that the sourness of the raw mango balances the hotness of the chilies in this recipe. seems an interesting recipe… am going to try it right away… how long can I store it ? I am making this tomorrow.. especially after your description of this with hot rice and ghee..you got me there!!! have never had it before.. but coconut and raw mango.. you cant go wrong.. can you!! 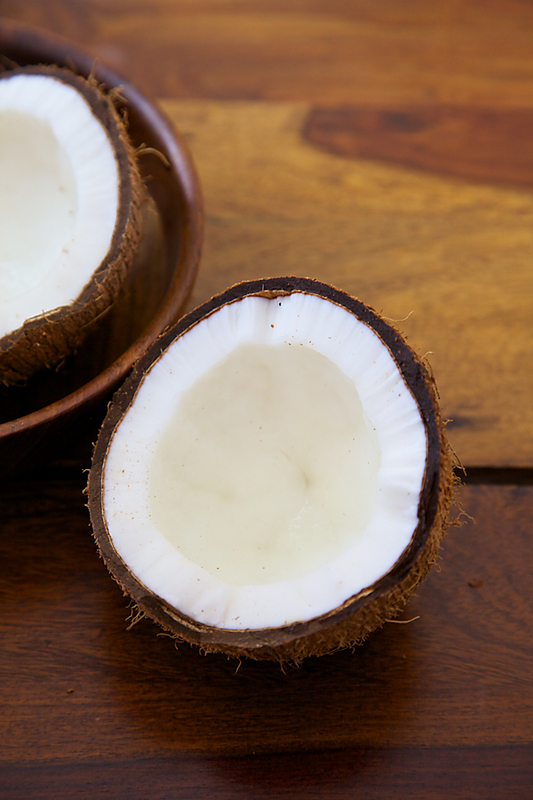 Mansi: If you roast the coconut well, it can last for a couple of days in the refrigerator. I like to use it on the same day though. 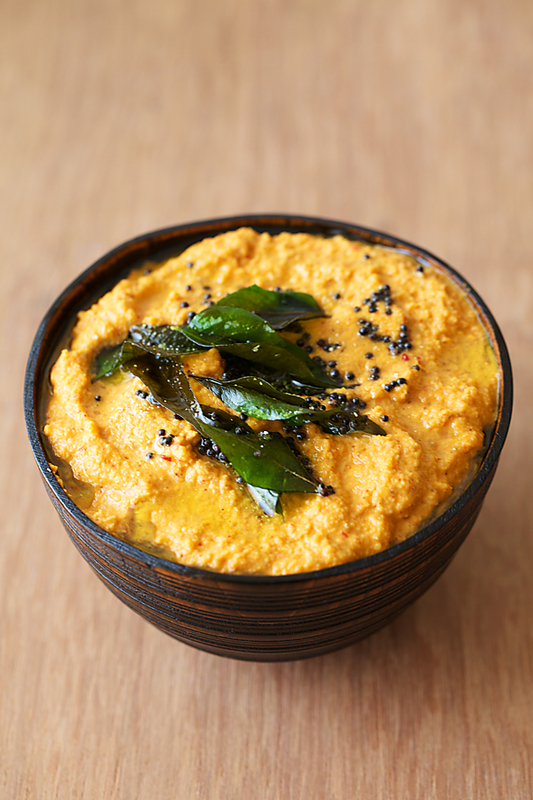 This raw mango chutney looks amazing Anu. I could just scoop out a dollop and hav e it with dosas! Thanks Anu! My Husband has asked me to prepare gojju chatney several times…but I did'nt know the exact procedure…he loves to eat this chutney with dosas…Thanks once again. Wow this looks delicious! I love mango chutney but never knew how to make it. I'm going to give your recipe a try. This looks phenomenal. I can't wait to try it out! We make variety of mango chutneys. This one is similar to huli arpa we use to make huli or kodhel from mangalore region. My mom would make this often. I can sense the flavor of the dish just by your tempting clicks. Delicious! one of my good friend's is telugu, and her mom makes amazing mango chutney.. i love all the chutnies which go so well with rice. DELISH! Oh my! mango chutney looks so Yum! I tried mango rice from this amazing blog and it was great! Thank you so much for sharing so many great traditional recipes. chella: So nice to hear that! Am happy you enjoyed it. It looks awesome, will surely try to prepare it. I have published a maharashtrian recipe of mango, hope you will like it. What a fantastically flavor filled but simple recipe. Made it for the first time a few days ago & it was an absolute star in the uttapam & appam meal we had planned. Thanks, and do keep sharing! 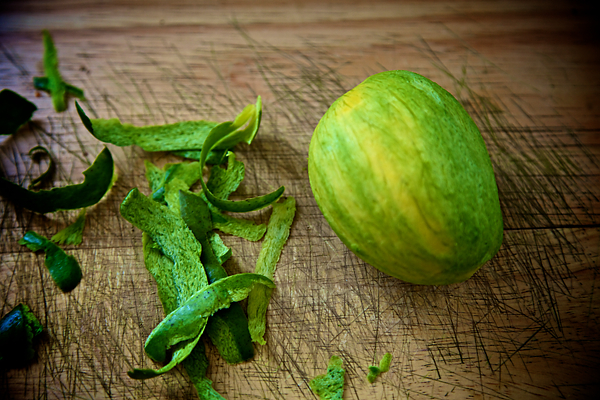 The raw mango chutney has its medicinal properties during the summer time. It helps people from heat waves known as loo in excessive hot areas..
Sujoy: You are absolutely right!